In order to understand what Discmania is about, one needs to take a look at the big picture. You see, Discmania is not only a disc golf equipment brand, but a lot more. First, let us take you to our humble beginnings. The beginning of our journey is the journey of one man, the Discmania CEO Jussi Meresmaa. Essentially everything started in late 1994, when Jussi got his hands on the very first golf disc, the Innova Gazelle. Like with many new players, the whole concept of the game seemed maybe even a bit funny at the time. After the first couple throws, Jussi was hooked. The only problem was that there was not much happening in disc golf in his hometown of Tampere. As a man of action, Jussi started organizing weeklies and all kinds of tournaments with his friends on a course right next to his house - the legendary Vihioja Park in Tampere, Finland in 1994. Even now, 22 years later, this course remains to be somewhat of a spiritual home course for Discmania and many of its employees. So, we’re living the mid-90’s, Finland has won it’s first World title in ice hockey, we have a few permanent courses, but we’re faced with the next big challenge. How to get discs in the hands of the people? Lack of equipment is a quite sizeable hurdle, if you want to attract more people towards the sport you love. Fast-forward a few years of hustling discs from anywhere you can get them, some from an importer up the coast, some directly from the US in group orders. This simply was not convenient enough. By the turn of the millennium, Jussi would have made an agreement with the local importer to buy discs off him in bulk and to get a small compensation for every disc sold. By all means this is not enough to bring the food on the table for Jussi, who had just had his first son. Selling those discs from the trunk of his car was about something else entirely. What he has always been great with, is facilitating. Having discs available at the Monday weeklies at the Vihioja Park opened the opportunity for more players to find the sport. Around this time Jussi had landed his first sponsorship deal with Millennium Golf Discs, being the first Finn to be picked up by a disc golf manufacturer as a player. Around this time Jussi would also be dominating the emerging European tournament scene, knocking down top placements on EuroTour events and on the Finnish National tour. Jussi Meresmaa putting at the legendary Järva DiscGolfPark in Stockholm, Sweden back in the 1990's. Unfortunately enough, disc golf in Finland was not ready to support anyone full time in the early 2000’s. Jussi decided to get a degree in marketing and entrepreneurship and to start his own company, an advertising agency. Looking back in 2016, Jussi’s time in the advertising world still shows in just about everything he and his companies do. Working as a partner in not one but two different ad agencies, Jussi slowly started to put together a vision on where the sport of disc golf should be heading. Before mid-2000’s his humble disc retail business had started to grow. Information technology has always been close to Jussi’s heart and as a man often ahead of his time, he had set up a disc golf web shop in 2003. The name of the shop was Frisbeezer, Jussi’s nickname on the lively disc golf messaging boards. Entering the world of e-commerce opened up a new chapter not only for Jussi, but the Finnish disc golf scene as a whole - finally there was a way to acquire new discs all across the country with no extra hassle. By mid-2000’s the Frisbeezer web shop had found its warehouse and headquarters in the garage of Jussi’s parents, who were also highly involved in the daily work with the online store. Jussi’s dad, Timo, an avid disc golfer and masters division EuroTour winner himself, was a founder of Frisbeezer offering facilities and labor from the start. 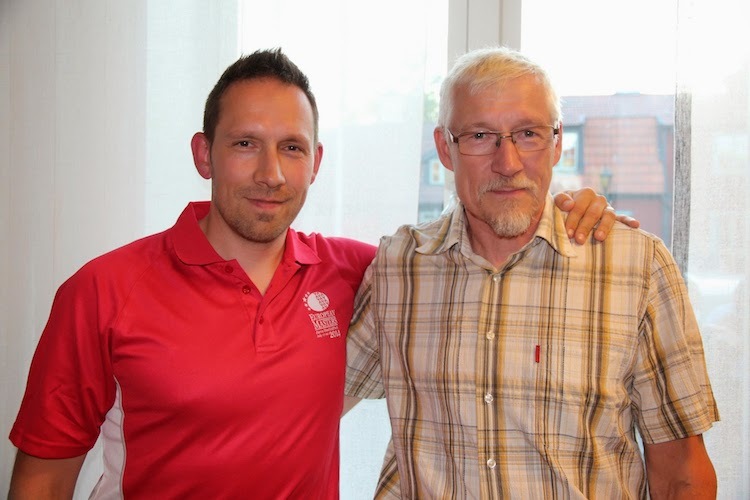 Jussi and his father Timo at the 2014 European Masters in Stockholm. Photo: Erno Väyrynen. By this time, Jussi had also made his first trips to the US to attend the USDGC among other competitions. 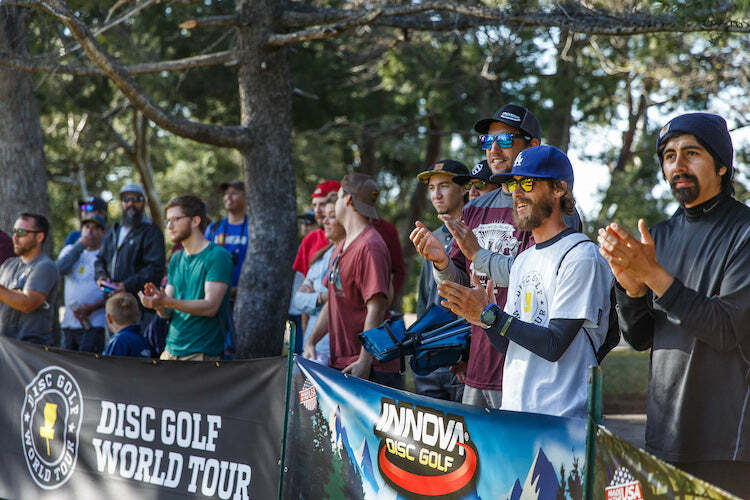 As a fruit of these trips, Jussi had also formed a relationship with Dave Dunipace, Harold Duvall and Tim Selinske, the owners of the ultimate mother company of the sport of disc golf, Innova Champion Discs. This relationship would be essential for the next phase Jussi had in mind - his own line of golf discs. Around mid 2000’s the first disc companies had already pushed out a big selection of different kinds of discs. For someone new to the sport, this array of different models to choose from could have felt a little overwhelming. Jussi’s vision was to have a simple line up of discs, that would have names that within themselves are self-explanatory (at least to some extent) on how one should expect the disc to behave. With this idea and relationship with Innova, a new brand of discs was born. The first disc was named MD1 (Midrange Driver 1) and it was received with praising reviews both in Europe and the US. The release date of this disc (December 1st, 2006), is also what we consider to be the birth of Discmania, a brand that would reinvent the games of thousands of players across the globe from the recreational to the touring professional. The MD1 would be soon be followed by the very first Discmania putter, the P1, and soon after that came out the the first driver, the CD (Control Driver). Simultaneously with the CD, the first true Discmania classic was born - the P2 putter. The P2 combined the popular Aviar/P1 beadless feel with a flight path that would stay true straight in high speeds and fade predictably in low speeds. To this date, the P2 is a staple for most Discmaniacs out there and the most popular putter among advanced and pro players in Europe. We'll probably never have the widest selection, and we'll always consider very carefully what kind of products we bring to the market. You can review our current disc lineup here. This is also the time when Team Discmania was born. Our team members have played an important role in the growth of Discmania and the sport as a whole. Team Discmania has featured many top players since its inception. Most notably are 2009 World Champion Avery Jenkins, 2012 European Champion Simon Lizotte, and young and upcoming phenom, Eagle McMahon. The titles and accolades for Team Discmania don't stop there. We also have the 2016 European Champion Leo Piironen, 2014 Women's European Champion Jenni Eskelinen, Collegiate National Champions and United States Amateur Champions on the team. More importantly, all of our members are held to the highest level of professionalism and representative standards in the game. It's important that our players not only excel in the sport, but are also good people off the course. Leo celebrating after making the final putt for the 2016 European Championship in August. Photo: Eino Ansio. 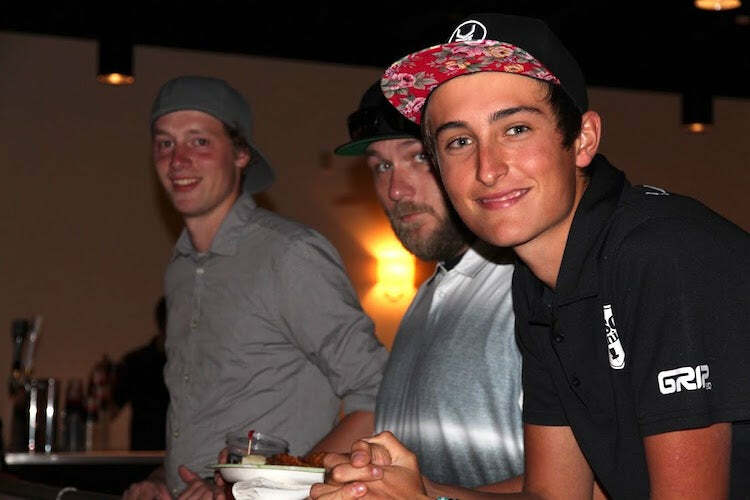 Simon and Eagle at the 2015 USDGC Player Meeting, when the Disc Golf World Tour was announced. Photo: Erno Väyrynen. But let’s take a step back and focus on what happened, as the Discmania line was starting to shape up. The online store had been growing steadily and as the market grew as whole, there started to be demand also from some of the Finnish sporting goods stores. At this time, Jussi realized that the moment he had been waiting for was finally about to emerge. In late 2008, Jussi left his day job at the advertising agency and started a new company, Innova Champion Europe Ltd. Around that time Jussi also hired his first employee outside the family. He was a Turku native Juho “Always a Happy Guy” Rantalaiho. Together with Juho they started to execute a plan Jussi had been working on for years. This is where we get back to Jussi’s unique ability to facilitate things to happen. From a distance, the formula is quite simple: In order to grow the company, you need to grow the sport. In order to grow the sport, you need 3 things: Courses, aka places where people can play; Equipment that is easy to acquire; and publicity for the sport. Now we’ll get into the publicity part a little later, but let’s first concentrate on the equipment. For a relatively unknown sport, it’s actually quite amazing that Jussi and Juho were able to land a deal of equipment distribution with the biggest chain of sporting goods stores in Finland, Intersport. All of a sudden, disc golf products were available all across Finland, generating probably the biggest surge of exposure for the sport outside the scene itself so far. With the great products of the Innova family, including the Discmania’s models available at the time, many people found a new lifetime hobby from the aisles of the sporting goods stores. Concentrating our operations only in Finland has never been the plan. Internationality is one of the four core values of the company. The other core values are Innovativeness, Perseverance and Openness. We focus on them in each of our weekly meetings, where we discuss how our work supported these values each week. Everyone in the company knows these values by heart. Whatever we do from designing DiscGolfParks, to selling equipment and organizing large events, or to innovating concepts like Discmania Combine, it is fueled by our values. We are the first global disc golf business with offices and representatives in several European countries. Furthermore, we established our US office Discmania, Inc. in the beginning of 2014. While setting up the distribution channel for the disc golf products was a great achievement, simply having the equipment out there was not enough to get people introduced to the sport. What really changed the game was the introduction of a simple way for communities and companies to acquire courses. 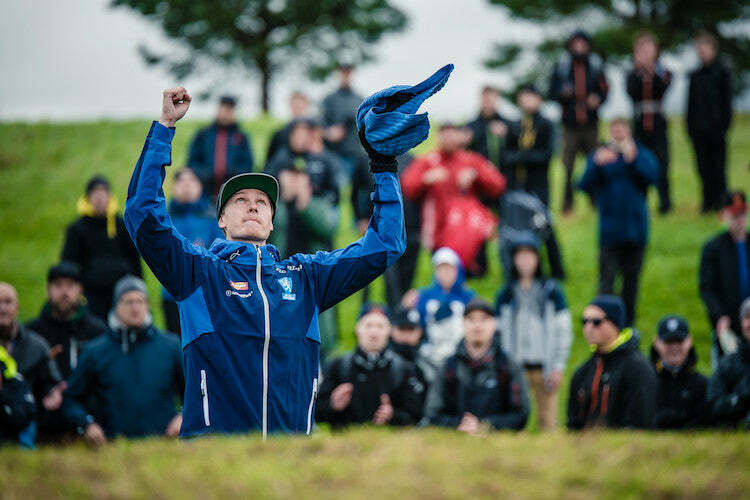 DiscGolfPark was fuel to the fire of the Finnish disc golf boom. The DiscGolfPark concept carries the ideology, that a course is more than a set of baskets in the woods - it’s a complete package including course design that takes into account both the safety measures towards the other users of the area, as well as the needs of players of different skill levels. Besides the design aspect, the DiscGolfPark concept features turf TeePads, targets and map design produced by a professional and featured on TeeSigns and and InfoBoards at the course. Essentially, what DiscGolfPark offers, is a low entry level environment for new players, opposed to most courses that were not as easily approachable. And the best thing about DiscGolfPark and disc golf courses in general is that when compared to just any other sports facilities, their cost is very low. This combination of cost-effectiveness and approachability made DiscGolfPark a perfect match for the newly founded demand of the Finnish market. But while the old saying of “if you build it, they will come” does apply to some extent, the success story of the Finnish disc golf scene was not build on just this one block. You see, there’s only a limited amount of attraction towards shiny metal baskets in the parks, if the people don’t know what they are about. And while having courses within reach equipped with proper signage and a network of places to pick up the necessary equipment, active sports promotion was at the very foundation of the growth spurt of disc golf in Finland we’ve witnessed in the past ten years. As marketing was at the core of Jussi’s know-how, the people working around him happened to come more from the world of marketing and communications, rather than from the world of sales. It’s a popular saying here at Discmania that “we are an organization dedicated to promote disc golf and we happen to sell some merchandise along the way”. This is not to say there wouldn’t be a whole lot of passion towards the products we put out. Simply put, we’ve always been very focused in first and foremost promoting the sport both inside and outside the existing player base rather than trying to push our brand to those who already have their bags full of discs. Despite this lack of maximizing short-term sales, one will find our disc golf equipment available everywhere in Finland. The amount of courses has exploded from 20 to almost 600 in 15 years. Disc Golf has been on national TV almost every year since the European Championships in 2005. The sport is constantly referenced in popular culture, such as TV series and hit songs. Disc Golf is an everyday thing in Finland. One might ask, what next? For the past three years, a group of influential Finnish Disc Golf promoters, including some of our staff, have developed a Finnish Disc Golf Trainers’ association. This has been done in collaboration with the governing body, Finnish Disc Golf Association. The purpose of this project is to create a multi-level educational system for Disc Golf in Finland. This way the sport will be there to stay; it will not fade away when the biggest boom is over. They have already trained over hundred instructors, who now teach disc golf exactly the same way and with same materials. For 2017, the main priority is to educate schools on how to take disc golf in their physical exercise program. In the near future, there will be dedicated coaches and organized youth camps. Organizing tournaments has always been in the core of promoting the sport. From the biggest ones regionally - to biggest in Finland - to biggest in Europe and eventually more or less the biggest tournaments in the whole world. European Open 2015 prize ceremony. Photo: Eino Ansio. 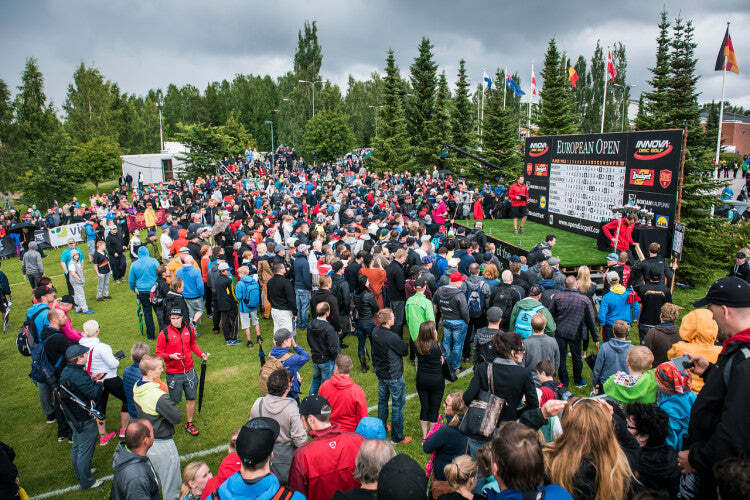 While Tampere-based Midsummer Disc Golf Festival and the Finnish Open, classic must-attend events of the late 90’s and early 2000’s should deserve a couple of chapters here themselves, let’s jump to the one event that kicked off the growth of disc golf in Finland, the 2005 European Championships. EC2005 was ran by Jussi, with an active role as the Tournament Director and Event Promoter. Located in Tampere and the next town down the road, Nokia, this was the perfect time for Jussi and his group of trusted allies to show the disc golf world their vision of how events should be run. Despite minor hiccups thanks to the traditionally erratic Finnish weather, the event was a success. It featured an array of all new things as far as disc golf tournaments go: The results were posted online in just about real time (remember, this was 2005, 2 full years before the first iPhone was released), the event had it’s own press manager and a dedicated reporter; there were even film crews on site to capture a 30-minute recap show that was shown on Finnish National TV. We bet there will be a couple of Finns out there reading this article that remember seeing that show and finding a new sport through that. Before the turn of the year, Jussi already had a new tournament concept in mind - The European Open. Sure enough, in July 2006 the best US players at the time (Climo, Feldberg, Jenkins, Doss) found their way to Finland to challenge Europe’s finest in the very first PDGA Major event in Europe. At the 2006 European Open and the editions that would follow it, Jussi and his crew would continue to pursue two important goals: creating the best and most professional disc golf event out there for the players and using the event as a canvas to showcase the sport to disc golf fans and new audiences. Those who have been in one or more of these events can probably tell you that these goals were oftentimes met at a level never before seen in our sport. Here's a throwback video of the first European Open in 2006. It may look a bit funny in today's media age, but it's worth pointing out that all the elements for creating a premium platform for the sport were already there. Let’s fast-forward to the USDGC in 2015. At the players meeting, Discmania CEO Jussi Meresmaa unveils his plan for the future: The Disc Golf World Tour. A premier tour showcasing the best this sport has to offer. Looking back now, a lot has happened since then. First of all, while nothing like this had been done before, Jussi’s announcement was soon to be followed by another similar one, as a long-time disc golf promoter Steve Dodge introduced us to the Disc Golf Pro Tour, a US-based Pro tour that would more or less challenge the PDGA's National Tour. While the announcement of the World Tour was greeted with enthusiasm, over the following 12 months some voices would turn sour. It seems evident that not everyone fully understands the concept of the tour. What has been one of our greatest features in the long run, has started to somewhat work against us. When everything looks just about as professional as the big money sports you see on TV, one can easily start to expect we are capable of playing with the same deck of cards as the main TV sports out there. Naturally, this is not the case. Yet. Disc Golf World Tour’s purpose is to expand the awareness of Disc Golf all over the world. For Jussi and Discmania, it is really important to promote the sport all over the world. The biggest existing disc golf market (United States) has already well established tours, so DGWT’s mission is to promote Disc Golf actively outside the US. The challenge with big pushes like the DGWT is, there really is no existing revenue stream that would make it sustainable. Organizing the tour had a six-figure price tag for the first season, but the money coming through partnerships, fundraiser sales etc, is nowhere near that number. This means the money has to come from somewhere else and that also means there’s no way we are able to cater to every individual taste. Currently, we are going through very important and interesting meetings regarding the future of the tour. We'll do our very best to reach our goals set for the tour. We also need to patient while striving for them with our partners. A big thanks to our tour partners: Innova Champion Discs, Grip EQ and Dude Clothing. With them, we feel great going into the second season of the Disc Golf World Tour. It starts with the Aussie Open in January. 2016 La Mirada Open spectators. Photo: Stuart Mullenberg. The reason we wanted to shed light on all of these matters is that the way we see it, Discmania is not just a disc golf equipment brand. It’s one valuable piece of the whole puzzle behind it: the events, the courses, the discs, the people. Every element in this picture feeds the other. 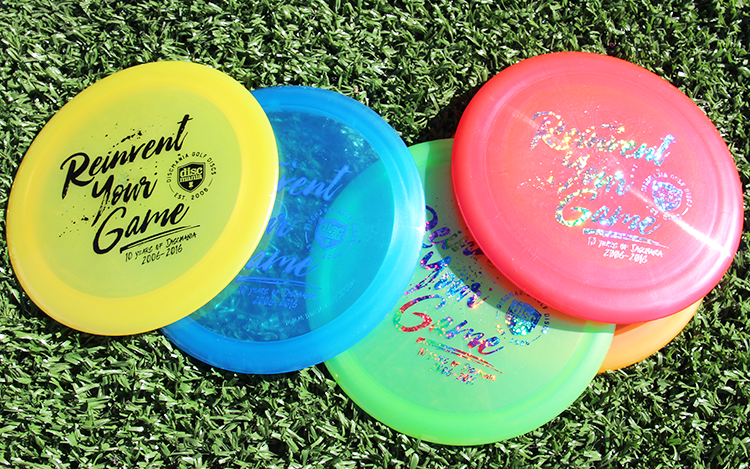 By supporting Discmania, you’re supporting the growth of our sport. It’s not just from players to players, but from players to players and then some. Our purpose is to make the sport of disc golf the best it can be. Sometimes we face growing pains and other times great victories. The bottom line is, wherever we’re heading, we’re not there yet. Whatever the future may bring, we want to be prepared for it. The past 10+ years have been an amazing ride, and we’re looking forward to another 10 years of great things for not only Discmania, but the sport we love dearly. Thank you for supporting Discmania and remember to score low! We'll have a small batch of 10-year anniversary discs coming out soon to celebrate the occasion. At selected dealers (Hazy Shade Disc Golf, Infinite Discs, 1010 Discs Ideal Discs and Luna Park Disc Golf) this week, and at the Discmania Store a bit later.